that are almost ready to join their fleets. Last time we discussed Neue Mein Schiff 2 (you can check the article via this link). Today we are going to “visit” Viking Jupiter, an upcoming addition of Viking Ocean Cruises. The all-verandah Viking Jupiter cruise ship with a tonnage of 47,800 GT will accommodate 930 cruise lovers in 465 cabins. Currently, she’s being added some last touches at the Fincantieri’s shipyard in Ancona, Italy. It's only a couple of weeks before the ship departs on her maiden sailing. So are you ready to check several exciting shots from her construction site? Viking Jupiter touched the water for the first time on May 10, 2018. No doubt a float-out ceremony is an important milestone in the construction process, and that’s how this momentous event looked like for Viking Jupiter. These pictures are so symbolic. Two beautiful representatives of Viking Cruises, Viking Orion and Viking Jupiter, are getting ready to start their cruise career side by side. By the way, Viking Orion was delivered in June 2018 and already takes her guests on exciting sailings in different parts of our planet. Now it’s Viking Jupiter’s turn. Our heroine is scheduled to operate voyages in Europe and South America. She will take her friends to the welcoming ports in the Mediterranean and Northern Europe. Besides, the vessel will invite travelers to explore the fantastic Chilean Fjords and enjoy Transatlantic crossings. Like her elder sisters, Viking Jupiter is a destination-oriented ship. 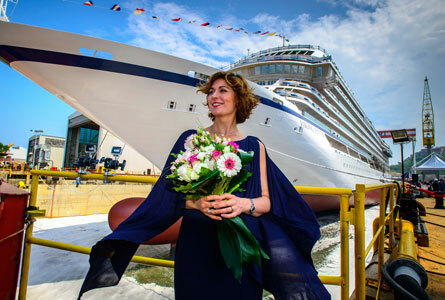 Her design, onboard amenities, itineraries, shore excursions – everything is aimed to help cruise travelers immerse themselves in the atmosphere of exciting adventures, explorations, discoveries. Fewer days at sea, longer stops in ports, more overnight stops. It’s time for sea trials. Now let’s check several pictures of her interior. What do you think? As for us, we can’t wait to see more photos and videos of this beautiful cruise ship. Well, and we can’t wait to see her for ourselves, of course. By the way, who can guess the next heroine of this series of articles? You can find the answer here.